بررسی رابطه پرستون بین میانگین طول و زاویه میکروفیبریل تراکئیدها در چوب فشاری و مقابل فشاری سرو سیمین (Cupressus arizonica). اولادی, رضا, پورطهماسی, کامبیز, پارساپژوه, داوود. (1396). بررسی رابطه پرستون بین میانگین طول و زاویه میکروفیبریل تراکئیدها در چوب فشاری و مقابل فشاری سرو سیمین (Cupressus arizonica).. مجله صنایع چوب و کاغذ ایران, 8(3), 387-397. رضا اولادی; کامبیز پورطهماسی; داوود پارساپژوه. "بررسی رابطه پرستون بین میانگین طول و زاویه میکروفیبریل تراکئیدها در چوب فشاری و مقابل فشاری سرو سیمین (Cupressus arizonica).". مجله صنایع چوب و کاغذ ایران, 8, 3, 1396, 387-397. اولادی, رضا, پورطهماسی, کامبیز, پارساپژوه, داوود. (1396). 'بررسی رابطه پرستون بین میانگین طول و زاویه میکروفیبریل تراکئیدها در چوب فشاری و مقابل فشاری سرو سیمین (Cupressus arizonica). ', مجله صنایع چوب و کاغذ ایران, 8(3), pp. 387-397. اولادی, رضا, پورطهماسی, کامبیز, پارساپژوه, داوود. بررسی رابطه پرستون بین میانگین طول و زاویه میکروفیبریل تراکئیدها در چوب فشاری و مقابل فشاری سرو سیمین (Cupressus arizonica).. مجله صنایع چوب و کاغذ ایران, 1396; 8(3): 387-397. در یک درخت سوزنی برگ، غالباً افزایش طول تراکئیدها با کاهش زاویه میکروفیبریل‌های لایه 2S (زاویه میکروفیبریل) همراه است. پرستون رابطه‌ای ریاضی بین این دو ویژگی ارایه داده که صحت آن تاکنون به صورت مستقل کمتر مورد بررسی قرار گرفته است. از این رو، در این پژوهش، روند تغییرات طول و زاویه میکروفیبریل تراکئیدها از مغز تا پوست در چوب فشاری و مقابل فشاری گونه سرو سیمین (Cupressus arizonica) مورد بررسی قرار گرفت و تلاش شد تا رابطه بین این دو متغیر بصورت کمی تعیین گردد. نتایج نشان داد که میانگین طول تراکئیدهای چوب فشاری کوتاه‌تر و میانگین زاویه میکروفیبریل آنها بیشتر از چوب مقابل فشاری بوده و در هر دو منطقه با دور شدن از مغز، متوسط طول تراکئیدها افزایش یافته و زاویه میکروفیبریل آنها کاهش می‌یابد. در هر دو منطقه، رابطه قوی و معکوسی بین این دو ویژگی یافت شد که این رابطه در چوب فشاری و حالت کلی (مجموع چوب فشاری و مقابل فشاری) از نوع غیر خطی بود. درمجموع، وجود رابطه پرستون بین این دو ویژگی آناتومی مورد تایید قرار گرفت. Tarmian, A., Faezipour, M., Karimi, A.N. and Parsapajouh, D., 2008. The heterogeneity in physical properties of wood in spruce trees (Picea abies) containing compression wood. Pajouhesh & Sazandegi, 78:158-166. (In Persian). Timell, T.E., 1986. Compression wood in gymnosperms. Springer-Verlag Berlin. Heidelberg, Germany, 625 p.
 Fathi, L., Bahmani, M., Saadatnia, M.A., Poursartip, L., 2017. An investigation on anatomical and mechanical properties of vascular bundles in Date palm (case study: Ahvaz countryside). Iranian Journal of wood and paper industries, 8(1):109-118. (In Persian). Courchene, C.E., Peter, G.F. and Litvay, J., 2006. Cellulose microfibril angle as a determinant of paper strength and hygroexpansivity in Pinus taeda L. Wood and Fiber Science, 38(1): 112-120. Zobel, B.J. and van Buijtenen, J.P., 1989. Wood variation: its causes and control. Springer-Verlag Berlin. Heidelberg, Germany, 363 p.
 Sheng-zuo, F., Wen-zhong, Y. and Xiang-xiang, F., 2004. Variation of microfibril angle and its correlation to wood properties in poplars. Journal of Forestry Research, 15(4): 261-267. Chiu, C.M., Lin, C.J. and Wang, S.Y., 2005. Tracheid length and microfibril angle of young Taiwania grown under different thinning and pruning treatments. Wood and Fiber Science, 37(3): 437-444. Mansfield, S.D., Parish, R., Ott, P.K., Hart, J.F. and Goudie, J.W., 2016. Assessing the wood quality of interior spruce (Picea glauca × P. engelmannii): Variation in strength, relative density, microfibril angle, and fiber length. Holzforschung, 70(3): 223-234. Bergander, A., Brändström, J., Daniel, G. and Sahnen, L., 2002. Fibril angle variability in earlywood of Norway spruce using soft rot cavities and polarization confocal microscopy. Journal of Wood Science, 48(4): 255-263. Preston, R.D., 1948. The fine structure of the wall of the conifer tracheid III. Dimensional relationships in the central layer of the secondary wall. Biochimica et Biophysica Acta, 2: 370-383. Preston, R.D. and Wardrop, A.B., 1949. The fine structure of the wall of the conifer tracheid IV. Dimensional relationships in the outer layer of the secondary wall. Biochimica et Biophysica Acta, 3: 585-592. Preston, R.D., 1988. Cellulose-microfibril-orienting mechanisms in plant cells walls. Planta, 174(1): 67-74. Wardrop, A.B. and Dadswell, H.E., 1950. The nature of reaction wood II. The cell wall organization of compression wood tracheids. Australian Journal of Biological Sciences, 3(1): 1-13. Barnett, J.R. and Bonham, V.A., 2004. Cellulose microfibril angle in the cell wall of wood fibres. Biological Reviews of the Cambridge Philosophical Society, 79(2): 461-472. Echols, R.M., 1955. Linear relation of fibrillar angle to tracheid length, and genetic control of tracheid length in slash pine. Tropical Woods, 102: 11-12. Lin, C.-J. and Chiu, C.-M., 2007. Relationships among selected wood properties of 20-year-old Taiwania (Taiwania cryptomerioides) trees. Journal of Wood Science, 53(1): 61-66. Kibblewhite, R.P., Evans, R., Grace, J.C. and Riddell, M.J.C., 2005. Fibre length, microfibril angle and wood colour variation and interrelationships for two radiata pine trees with mild and severe compression wood. Appita Journal, 58(4): 316-322. Franklin, G.L., 1945. Preparation of thin sections of synthetic resins and woody-resin composites, and a new macerating method for wood. Nature, 155: 51-51. Oladi, R., Parsapajouh, D. and Pourtahmasi, K., 2009. A comparison between three methods of measuring microfibril angle in compression and opposite wood of Cupressus arizonica. Journal of Forest and Wood Products (JFWP). 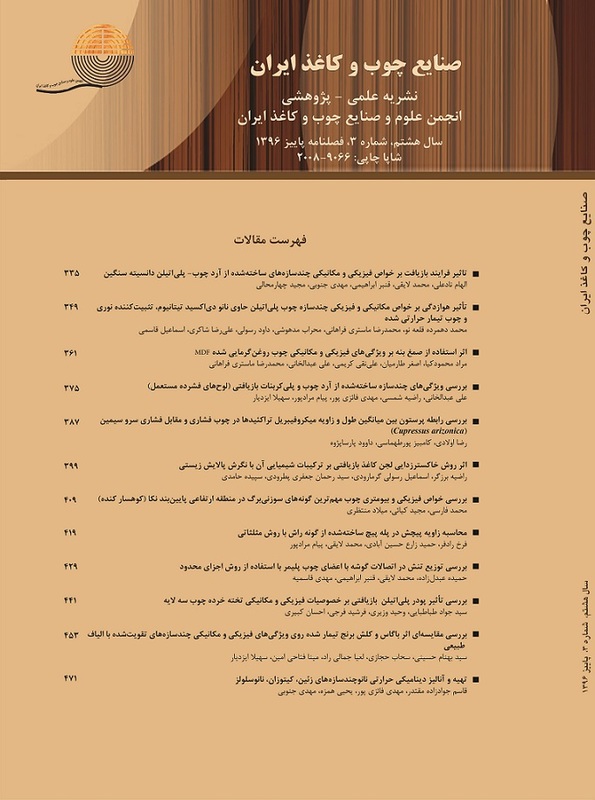 Iranian Journal of Natural Resources, 62(1): 21-33 (In Persian). Wang, H.H., Drummond, J.G., Reath, S.M., Hunt, K. and Watson, P.A., 2001. An improved fibril angle measurement method for wood fibres. Wood Science and Technology, 34(6): 493-503. Donaldson, L.A., 1991. The use of pit apertures as windows to measure microfibril angle in chemical pulp fibres. Wood and Fiber Science, 23(2): 290-295. Lachenbruch, B., Moore, J.R. and Evans, R., 2011. Radial variation in wood structure and function in woody plants, and hypotheses for its occurrence, in: Meinzer, F.C., Lachenbruch, B., Dawson, T.E. (Eds. ), Size- and age-related changes in tree structure and function. Springer Netherlands, Dordrecht, pp. 121-164. Yoshizawa, N., Kiyomiya, M. and Idei, T., 1987. Variations in tracheid length and morphological changes in tracheid tips associated with the development of compression wood. Wood Science and Technology, 21(1): 1-10. Clair, B., Alméras, T., Pilate, G., Jullien, D., Sugiyama, J. and Riekel, C., 2011. Maturation stress generation in poplar tension wood studied by synchrotron radiation microdiffraction. Plant Physiology, 155(1): 562-570.